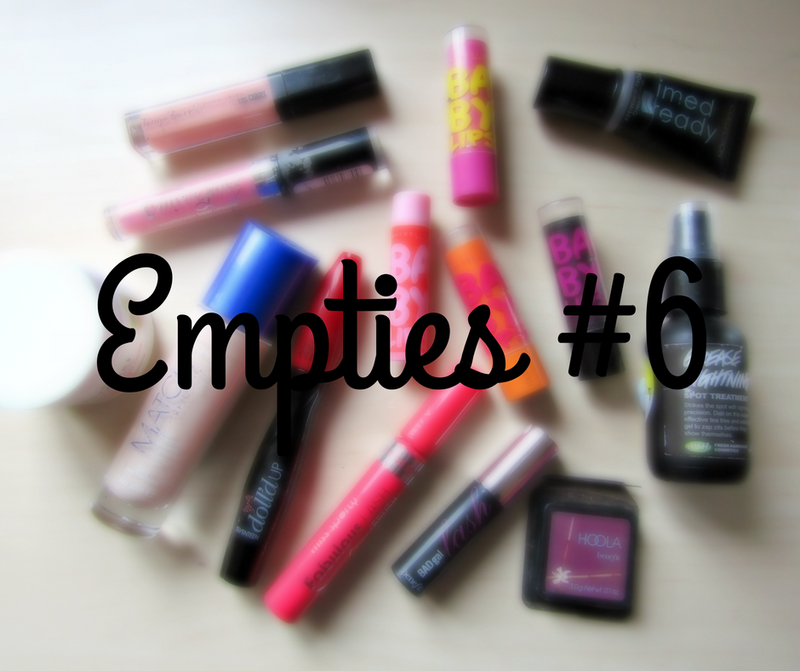 It's been a while since I have done an Empties/ Project Pan, like I said in my last Project Pan post I have decided to combine these two together to make 1 post instead of boring you and I with 2 Empties like posts. I don't really know what to say about this primer, I didn't notice my makeup lasting any less or any longer but I know I won't repurchase it as I have found a better primer that is the same price. I don't even know did it help my makeup last or not. This has smashed to pieces and I have decided to get rid of it as I have repressed in three times already and there is very little left. I was surprised how natural it looked on me and didn't make me look like I smeared orange on my face. I am not going to repurchase this again as it is expensive for a full size and it is tested on animals. I can't say enough good things about this product, if you have problems with getting a few spots this is an amazing spot killer. I would put a half a pump of this product on a couple of spots and overnight they normally would shrink and lose some of their redness. It is also from Lush, another reason to love it. I have finally picked up another one of these and I am so happy with myself. This is my current favourite night cream, I already am onto my second pot of this. I found this very moisturising, great for winter and it smells amazing. It is also very affordable and that's important as I am a student and have no part-time job. It doesn't aggravate my skin either which is always a good sign. This is my holy grail foundation as it is the only drugstore foundation that I have found so far that suits my skin tone. Being a paley like myself, it is near to impossible to find a decently priced foundation that isn't 2 shades too dark for me. 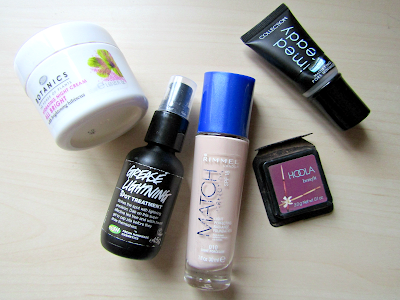 I feel that this is my 4th or 5th bottle of this foundation. I have the new formula one and I don't like it as much as the old formula. I find that the new formula isn't as liquidy as the old one. I have gotten used of it now though and I am happy with the coverage. The next few things that I have decided to throw out as they are all out of date by at least 1 year. I've had this mascara for maybe 1 1/2 years and I have barely used it. I know it seems so disgusting. I don't think I would repurchase this mascara as even thought it said it curled eyelashes but I found that it never did as my lashes are hard to curl even with a lash curler. I've had this for over 2 years and I think finely it is time to say goodbye, I will be keeping all the mascara wands as I like to switch up my mascara wands every so often. 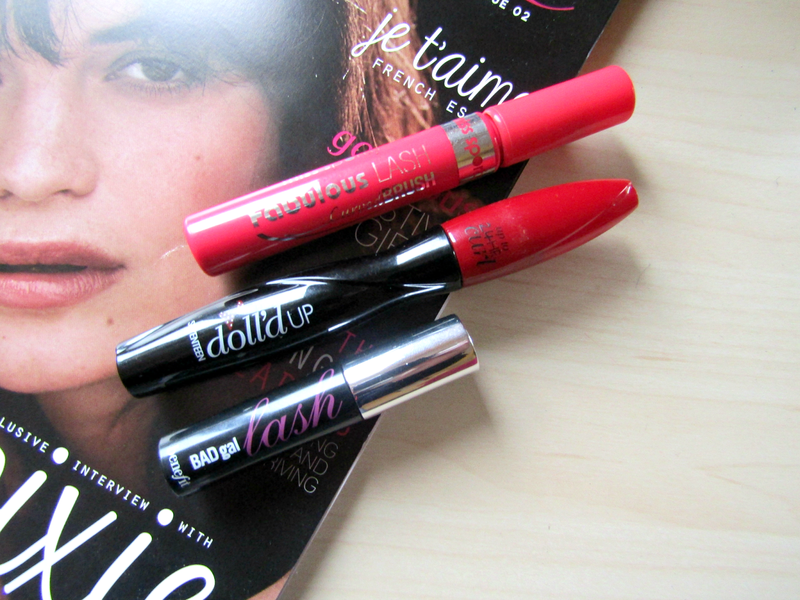 I really enjoyed layering this mascara with Miss Sporty one (that's below) and Covergirl Lash Exact. If you like volumizing mascara this one is your Gal (get it). I'm not sure will I repurchase this again. Another mascara I have had for far too long. This mascara surprisingly curled my eyelashes without using an eyelash curler. I enjoyed using this as I hate using an eyelash curler as in the past I have accidentally pulled out a few eyelashes while using it. I am not going to repurchase this again as it is tested on animals. 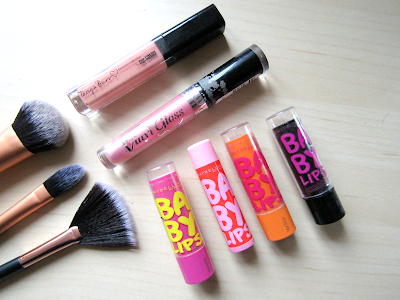 Remember these and the rage for these lip balms in 2011, yes I Googled it. I have some from 2012/13 that I haven't used very often and are at this stage gone past their use by date. I tried to finish these in a previous Project Pan but they are so hard to use up. I will not repurchase these as firstly I never really liked them and secondly they are tested on animals. Another thing stupid 12/13 year old Róisín bought. I suppose this is why I don't really like lip glosses that much now. I never really wore it much and I know it is time to part ways with this thing and I won't repurchase it again. I used to be a huge Tanya Burr fan and when I heard she was bringing out a beauty range I was so excited except the nearest place that stocked it was in Northern Ireland. I went on holidays to Belfast a year after and dragged my Mam into Superdrug to pick out one of Tanya Burr's lip glosses. This was the one I picked 'Picnic in the Park' and this was when I was going through my pink lip colour phase. I have had this for over 2 years and it is time once again to say goodbye. What are your most recent empties? Thanks for commenting Laura! Unfortunately, a lot of brands test on animals even some of the ones that state they are against it. Thanks for commenting Kate! I love reading these types of posts too.